We notice a description of a new(?) ga,s machine in the 3fe-chanics' Magazine, of Aug. 6. This machine is desciibed as being of any size desired, within certain limits, and the journal alluded to, considers it as an improvement upon anything hitherto known or employed in this direction. Some of our American inventors will have a hearty laugh over this, when they read the description of the apparatus the principle of which has been unsuccessfully tried over and over again in this country, in various forms, including the one described. The machine is stated to be " cylindrical in form having a space between an inner cylinder which receives the charge of rock oil and the outer case. From the charge cylin der the oil exudes slowly into the space referred to, at the bottom of which it is absorbed by a layer of wool. The vapoi \ rising from this oil in the saturated wool furnishes the essen I tial element in the gas to be produced ; the only other ele ment is atmospheric air, with which the vapor is diluted The air, which is only introduced into the machine when the consumption of gas is going on, is regulated in its admissioi by a piece of machinery actuated by a spring bo-rrel move ment, similar to that of a spring timepiece. The pump,which admits the atmospheric air, and the machinery with which it is connected, are put in motion as soon as gas begins to be drawn off, and the process of manufacturing the gas, the mixture simply of the atmospheric air with the vapor of the oil, at once commences and continues self-acting, as long as the charge of oil lasts, and gas continues to be drawn off. The process is beautifully simple, the gas being made instantaneously, without the application of heat, or any labor or attention whatever." 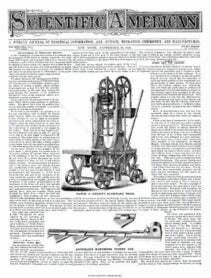 That the action of this machine is a repetition of the experience of many American inventors is evident from the following quotation from the journal referred to. " The gas, as we saw it produced, was not ver brilliant, but experience as to the qualities of the oils used, and practice in the use of the machine, will probably lead to the production of as high a quality as can be desired. According to the inventor's statement, a gallon of oil at 2s. 6d. will produce 1,000 cubic feet of fifteeurcandle gas, and a charge of 3 gallons will burn for 750 hours through an argand burner. The apparatus is adapted for use in houses, shops, theaters, churches, or other public buildings." It might have been added, that its adaptation to the above purposes yet remains to be demonstrated,and we can promise, that when the oil becomes impoverished by the evaporation of its nore volatile portions, or when its volatile character is decreased by a low temperature, the light will be still less brilliant than when exhibited to the editor of the Mechanics' Magazine. Such experiments have had their day in this country, and it is well understood, that the principle upon which they are based is wholly inadequate. Eight years ago we experimented with and tested a large number of similar devices. The results of our investigations were the following conclusions. First, only the lightest of the hydrocarbons will volatilize at, say, 50 degrees, with sufficient rapidity to supply even a few I burners with air gaturated with hydrocarbon vapor in the I proper proportions for illuminating purposes. Second, the oils, evenif sufiiciently light at first, rapidly become heavier by the consumption of their more volatile constituents, so that only a small proportion can be consumed ere the light begins to deteriorate. Third, if heat be apphed to any machine of this construction, even admitting the safety of such an application,the amount of condensation in the service pipes will soon generate a train of evils well known to those who have ben " through the mill," and which it is, therefore, unnecessary to specify here. These difficulties have compelled the abandonment of the principle, and with its renouncement, to the adoption of better plans for utilizing the valuable illuminating properties of the light hydrocarbons* One of these improvements was recently illustrated and described at length in these columns,and something which shall admit of adjusting the flow of the air to the volume of vapor generated, so that recondensation in pipes can be obviated, will be found an absolute essential ta the success of any device for manufacturing gas from the distillates of petroleum.